A rainbow of choices! Glad to see color weigh in to the general subject of food prep. In my very limited experience and repertoire, it features big. I’m trying to picture “orange and shiny” in relation to hard-boiled eggs, but all I can come up with is alien eggs from an asteroid shaped like a carrot. For me, deviled eggs (love the adjective) are a clear-cut distinction between yellow stuff and white stuff. (Here’s where you dust me off your computer screen.) You eat the yellow stuff, which must be slightly moist and malleable, and you discard the white, which has a conveniently non-stick surface like Teflon (and tastes the same). We boil eggs in the same way....that is how I've always done it. I always appreciate it when someone Bri vs a platter of devilled eggs to a pot-luck! I've never used curry powder in deviled eggs. Sounds like a good idea. Been laying off the mayo till surgery is over but next week I'll be able to devil up the hardboiled eggs I colored for Easter! I'll remember this one! Sully, I must agree with you - are you shocked? - that the egg white is flavorless. But it is necessary to the deviled eggs. It's a convenient little spoon for the filling that would otherwise require a utensil to eat. Unless - ooh, you've inspired an idea! - one could use the filling as a dip with pita chips! Pondside, that's what a friend was telling me recently. She wants them, but she wants someone else to bring them! Thanks, Jeanie. I hope you'll like it. Wishing you a successful surgery and speedy recovery! Thanks, Jean. I love the addition of curry! I love deviled eggs, but I'll only eat them if I (or my daughters) make them. It's just difficult to let go and trust other people to actually keep them CHILLED enough. It makes me shudder when I see them sitting out in the sunshine at a potluck dinner, for example. Good Morning Dearest Jean and happy day to you ! I so love eggs prepared in this way, in Liguria it's a traditional recipe for Easter, it's a 'hors d'oeuvre' we all so love in family and as a cold dish it is also so inviting during the Summer, perfect for dining with friends in the open country, maybe for a picnic ! Dear Not-Meaning-to-Sound-Snooty, you sound exactly like ME! I'm a maniac about food safety, especially at outdoor meals. I had to rebel at one we attended several years ago. We arrived right on time, many had arrived early and the foods they'd brought had been sitting out ever since. I inquired of the hosts about what time we'd be eating and got a very casual, "Oh I don't know. We're going to play baseball first." So I tactfully tried to make a point about food safety, to no avail. So I spoke to some friends nearby and started a little insurrection. We took our dishes over to a separate table and had our meal! Then we stored our foods until everyone else was going to eat and brought them out then rather than let them sit in the sun until after the game! Thank you, Dany! Yes, I love them for a picnic (though I would put them in a deep dish for transport rather than have them sliding around on my egg plate!). Deviled eggs are a treat! I always enjoy them. And I find that the white is definitely necessary as a smooth and bland counterpoint to the rich yolk filling. I do love that photo - it looks as if you couldn't resist eating just one! Lorrie, you are very observant! That gave me a chuckle. I said to myself, I want to have one empty egg spot so people can see the pattern in my favorite egg plate (but I think I really just wanted to eat one!). Haven't made or had a deviled egg in a while...I love mine with some heat, so these ae a perfect treat for me. Angie, a slice of jalapeno pepper makes a pretty garnish and supplies a bit of heat for those who like heat, and is easily removed by those who don't! Martha Ellen, I love that plate! I've had it forever and don't even remember from whence it came, probably an antique shop because I'd remember if it had been my mother's. Don't ever stop being "so picky" about food safety! I'd have never thought to add curry - I shall give it a try. One, invited to a potluck, I substituted ranch dressing to stretch an almost empty mayo bottle. The result was............. Not. Good. I think most of those devils were politely spit into napkins and deposited into the trash. Dawn, I think you're going to like them. But I must tell you, they are positively addictive! Mrs Shoe, that was worth a try! And I've seen people do it on purpose, but I don't like a garlicky "ranch" egg. I want the classic. Maybe garnish a few with snipped chives for garlic fans. Thanks for sharing this recipe,it looks yummy!Hugs,Maristella. Looks like a great classic recipe. Our DIL's Granny made a plate full for Easter brunch with some additions, bacon and jalapeno. They were delicious. I'm pretty sure I have that same deviled egg platter. Thank you, Ellen. Yes, bacon is a great garnish on those occasions that would otherwise be porkless! I'd like to find out more about this egg plate. they look picture perfect! and wouldn't last 2 minutes at my house! I got you added to the link up! Thanks for always being so supportive of the Country Fair Blog Party! You're never too late, Jean! Jan, thank you. That is so sweet of you! Country Fair is fun, low-key, always something good! I absolutely love eggs in any shape or form but I have to admit that deviled eggs are simply irresistible. My kids used to beg me to make them as a snack. We do, too, Marisa. We go through a lot of eggs around here! It's good that your kids were asking for deviled eggs instead of sugary snacks. I just made deviled eggs for our family Easter brunch in Germany. Your eggs look delicious, I always add some pickle juice . Thank you, Gerlinde. Pickle juice, sweet or dill, would make a lovely addition. Sometimes I put slivers of pickle on top. Greg, thank you. And, I agree, the discussion is fun. I'm just afraid a lot of readers might think, "Enough already with the yammering!" Have you tried the drop the eggs into boiling water method? I've thought about it for a long time but have never gotten around to it. Leave it to you, Jean, to give a more precise way to hard-boil an egg. As you might expect, I have always taken a more haphazard approach--but they always turn out. I'm going to try your instructions. Also I have never put curry in my deviled eggs. That sounds yum! As for the yellow vs orange, lately I have been gifted the most beautiful home grown eggs that come with the most egg-quisitely rich orange yolks. I don't think I could get a yellow yolk out of them! The only problem with deviled eggs is they're devilishly good and one can pop one after another down the gullet in a blink of an eye! Sue, thank you. As long as you boil the shine out of those "egg-squisitely" orange yolks, I'll be happy! Oh, and that "only problem," I know what you mean. I had too many eggs for two people to eat, so we ate waaaaaay too many! Devil's eggs (eyeballs) are also great for Halloween parties! Margie, I'll have to take your word for that - I haven't been to a Halloween party in decades! Grammy Dee, you're the best! Much appreciated. I laughed at Mr. Delightful's response of what he likes to take to a gathering!! I'm sure he loves eating your deviled eggs, and yes, aren't they a staple at parties? Your recipe sounds "delightful", Jean. Happy cooking/baking, and tea drinking! Thanks so much, Kitty! Yes, Mr Delightful is quite humorous! You're totally right, Jean: these do seem to be a popular and enduring treat! I was intrigued, when I moved to the US, to find shops selling special platters for these to go on. Pauline, I hate it when I get distracted and get that grey thing going. Doesn't really matter when making deviled eggs because the yolks are mashed, but when I'm putting sliced eggs on a salad I definitely don't want the grey. Yum! 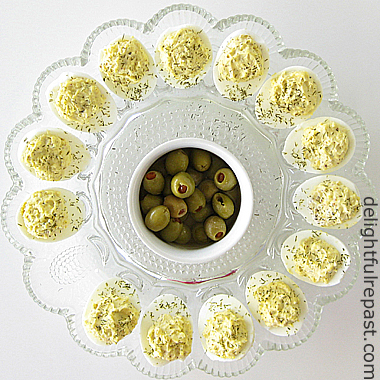 I love devilled eggs and yes, they are perfect at any gathering. Trouble is, at the moment these would make my cranky gallbladder even crankier so I can't enjoy them right now. But am I ever geared up for a big feast when the gallbladder goes bye-bye. I may just throw a party and invite the devilled eggs too! :-) Have a lovely weekend, Jean. Sandi, thank you. It's a wonderful thing, being rid of a cranky gallbladder! I think a party, especially a tea party, would definitely be in order! Thanks, David. And I'm sure you don't want garlic in them either! Sounds delish! I might make some for my bookclub. I like the way they look when the filling is piped in, but I don't know about pastry bags! LOL! Doreen, thank you so much! And Pins are always appreciated! Goodness, I have a ceramic and plastic carrier for devilled eggs yet haven't made them for ages. You're right, always a favourite for company or at a pot luck dinner. I love deviled eggs and I love the way you've presented them. Thank you, Amalia. My mother would have done a more elaborate presentation! Karen, thanks. I think just a touch of curry powder really makes it. A lot of people seem to have that plate! I completely agree with you on the doneness of a hard boiled egg. I love deviled eggs and these look delicious! Thank you Jean for linking up at the #BloggingGrandmothersLinkParty. I shared this post on Facebook, Google+, Pinterest, and Twitter. Grammy Dee, thank you! Those social media shares are so appreciated. They look yummy. #BloggingGrandmothersLinkParty. I’ve shared your post on social media. Thank you, Clearissa, and for the SM shares as well! Deviled eggs remind me of summertime, picnics, family reunions, and Sunday lunches. These look yummy! Thank you for linking up at #BloggingGrandmothersLinkParty. I'm sharing your post on social media. I agree, Carol! No food looks quite so much like summer as a plate of deviled eggs. I love deviled eggs! Yours look especially delicious. Thank you for sharing on #BloggingGrandmothersLinkParty. Dawn, thank you. Do let me know how they turn out for you! Hi Jean, I love devilled eggs they are always popular and as you say a classic. Thanks for sharing with us at #BloggingGrandmothersLinkParty. I've pinned and shared on social media. Thanks, Sue! And those SM shares are much appreciated! Love Deviled Eggs! Thank you for sharing on #BloggingGrandmothersLinkParty. I've shared on social media. +Deviled eggs are a special treat around here.. but alas, it seems I have lost my ability to shell the egg neatly.. Friends say your eggs are too fresh, or do this or that I watched the kitchen and tried their special technique of rolling the cooled egg on the counter... I just can't seem to get those rebellious shells off neatly anymore... any help would be greatly appreciated... BTW, I can't wait to add curry to my eggs..
Lori, thanks! I so appreciate social media shares. Schotzy, thanks, I hope you'll like the curry. Just a touch, not too much, really adds something, we think! About those pesky shells, here's something I've taken to doing and I think it really helps: Once the eggs are cooled a bit, I drain most of the water out of the pan, put the lid on, set the pan on a potholder and swirl it around quite vigorously for half a minute. When I take the lid off and start removing the shells, they come off much easier. Let me know if it works for you! GiGi, I know exactly what you mean! :D It's so easy to grab "just one more" and so on and so on and so on! I'm back again! Yum, these look so tasty. Now I need to go make some for me and hubby. Thanks, Grammy Dee! Can you deliver a batch for us?! Like the missing egg in the picture! Lovely dish -- I've never met a deviled egg I didn't like. This are perfection -- thanks. I love it when people bring deviled eggs to a party! I love to eat them, but I very rarely make them. I don't know why. I probably should just start making them, right?!! Michele, yes! Make a batch of these today. Or make half a batch! Jean, thanks for that helpful tip... I knew I just bought a fresh dozen today for a good reason.. hubs will be delighted with me... and with Mother's Day around the corner, I may have to work that a bit... perhaps at the Greenhouse hehehehe! Thanks, again! Schotzy, thank you! I do hope my egg-peeling tip helps you and that you'll like the eggs as much as we do. Let me know how it goes. BRnLC, I'm glad you fessed up about your occasional undercooking of the eggs! :D But as long as you don't do it for deviled eggs, I'm okay with that! TRT, thanks! Glad to hear he's carrying on the tradition! 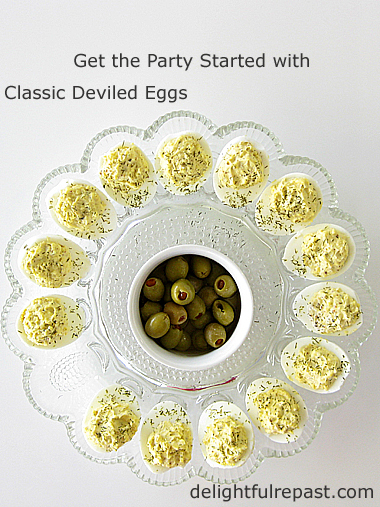 Devilled Eggs are so popular at our cocktail parties - yours look beautiful. I love that you add curry powder - my late Mom's recipe calls for curry powder and I always add it too. I haven't added dill though - I need to give that a try next time. Thank you so much for sharing with us at Hearth and Soul, Jean. Thank you, April. Yes, they are perfect for a cocktail party, something with lots of protein and a bit of fat to counteract the alcohol. My family requests deviled eggs at every family get together. I'm going to try adding your seasonings next time, they sound delicious. Thank you for sharing at #BloggingGrandmothersLinkParty! Thank *you*, aginglikeafinewine! I hope you and your family will like them - they always get raves around here! I love deviled eggs. Thx for your recipe. For almost every holiday dinner, my late mom made potato salad and deviled eggs. Mildred, thank you. Your mom and I would have gotten along - I'd be the first one to dig into the potato salad and deviled eggs! This is awesome. I love deviled eyes. Thanks for stopping by anointedtoday.blogspot.com.